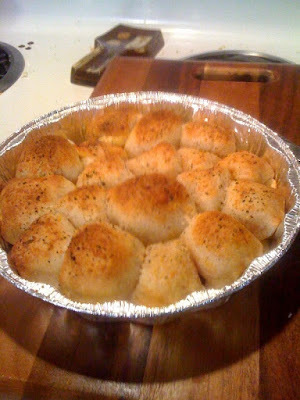 Ever since Annie of Annie's Eats posted these pizza bites, I've been wanting to make them. I had a similar idea in my head for the New Year's Eve party we hosted but we had so much other food that they got cut from the list. When Annie posted these, I knew I needed to make them. Here's the original recipe if you'd like specific instructions. I'm a sort of fly-by-my-pant's-seat (or however you say that phrase) type of gal when it comes to cooking so I have approximations and generalizations for this recipe. 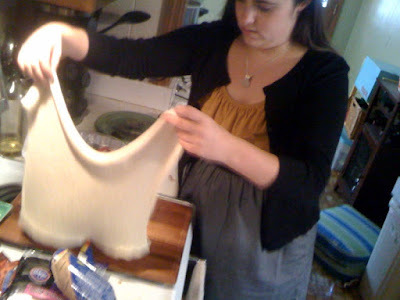 1) Take the pizza dough of your choice (we used pillsbury's canned as seen above but if you were really excited you could make your own) and lay it flat. cut squares that are about the size of bathroom tiles (3 by 3). 2) stick a pepperoni, cheese cube (we used colby jack), and pepperoni on the square (stacked in that order). 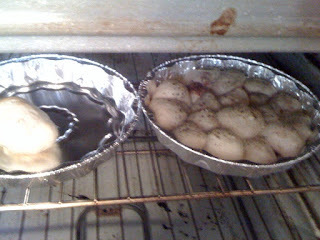 These were a HUGE hit at the super bowl party we went to - they were gone pretty quickly and we should have made more.